Or to save money in exchange for a seat of trouble…. Source: William Shakespeare & ME! Lily – you and Edward are a hot mess! I’m sure your mom is very gentle and loving when she bathes you! Don’t you want to stay clean and smell sweet? Hey Amanda – you did both of them? In one day? You’re my new SHERO! My back is still killing me! I gave our beagle Cricket a bath last weekend – it is not her favorite thing and she is sure to let me know that! She is very dramatic about the whole thing – grunting and groaning the whole time, and then later shuddering over the horror of it all, trying to make me feel guilty! Which of course, I do. BOL… that is an adorable shot of the 2 in the chairs! They’re just “chilling” waiting for the sun to go down! BOL! Too funny and you both are looking good!!! I’m going to lean out my car window and say Harley was at the spa as his furs look more like mine when I visit my spa lady. Haha, I LOVE this post!! It’s so cute!! You both did a great job! It’s always a fuss to wash doggies!! It’s more than a fuss for me – it’s a comedy / reality show all rolled up into one! well since Harley looks like he always has, I’d say you tried Jax. I’ve been doing the grooming for years on Cole and I know for sure he’s calmer. He might just look great too. The problem since I own the scissors, I groom for days… snip here, oh that needs shortening… clip a nail…pluck an ear…he sees it like cesar… she has that lean and hungry look! There is no way I could trust myself with a pair of scissors on them. They’d look a hot mess afterwards LOL I do good just with the bath part. It’s a lot harder than it looks isn’t it friend? Oh I love this post! 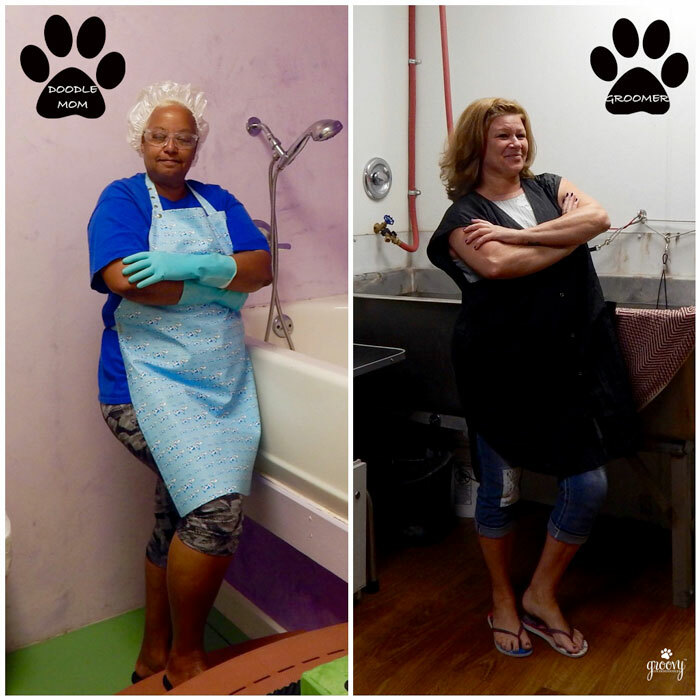 I’m the worst groomer – I’m intimidated by the tools and I think I’m going to cut someone’s ear off! These pics are FAB. I think the Dood on the right went to the groomer! Am I right? I know I know! 😉 Such handsome dudes. I just stick Mr. N in the tub and wash him. He gets blow dried in the winter/fall and mostly air dries in the summer. It definitely makes a difference lol. 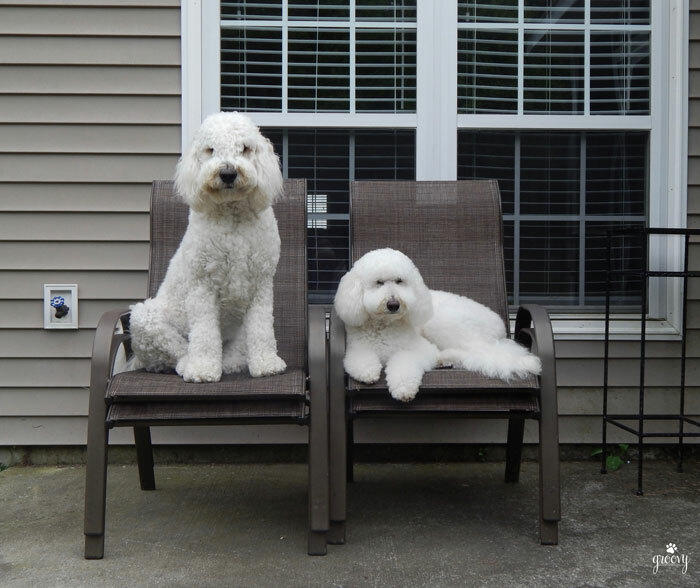 I also think the Dood on the right went to the groomer. It’s not easy to bathe a dog…especially not one whose as large as a Doodle. Looks like you performed a very good test here…The question is also, though, which Dood liked their bath better? HA! One thing I’ll share before Friday is “you’re absoDOODLEtutely right” dogs the size of Doodles is more than a handful (at least to me!) Can’t wait to meet you next month at BP! Rita hadn’t had a bath in ages, but she had to have one Sat night after getting skunked! ugh. The Boys have to get bathed regularly because they are always on the couches and in my bed. I don’t mind them on the furniture but they’ve got to be clean. Harley actually looks “pissed” when he’s super dirty! Plus all that hair holds lot’s of funk LOL How did you rid Rita from the skunk smell?